A vast amount of work has been done in recent years to improve the knowledge base of post-injury rehabilitation following an anterior cruciate ligament injury. Although a relationship between improved performance in objective functional tests and a reduction in re-injury risk is advocated in the literature, the results presented here suggest that future clinical practice might seek to use a combination of limb symmetry index benchmarks and absolute values that resemble those seen within a healthy active population. Furthermore, the results presented here also suggest that clinicians might prioritise more dynamic functional performance tests (and the rehabilitation themes they infer) if seeking to maximise post-operative return to sport potential, though cliniometric tests may still provide a useful baseline measure particularly during early stage rehabilitation. Further research is needed to better define the predictive criteria to reduce anterior cruciate ligament risk, particularly in reference to age and gender influences. Tim is a Sports Physiotherapist based in Canberra. He is the current Head Physiotherapist to St George-Illawarra Dragons NRL side and has also completed a PhD in anterior cruciate ligament and high-level knee rehabilitation and the association of functional outcome measures associated with this. Contact Tim on Twitter at: @_timmcgrath. Hanna, with over 15 years’ experience in longitudinal, multimodal data analytics for saving, structuring, and summarising data, is bridging the gap between computing and health sciences. She works in The ANU as a Senior Lecturer and Data61 as the Team Leader of TAMPA, Theory and Applications of Multimodal Pattern Analysis within the Machine Learning (ML) Research Group. Her papers been published in the most prestigious journals, cited 900 times, and awarded twice for a best paper and 4 times for the top ML methods for health language processing. Why do we need intelligent agents to support clinical judgement and decision-making for athletes' safe return to sport after anterior cruciate ligament reconstruction? Anterior Cruciate Ligament (ACL) injury of the knee during sport is a common injury that can be devastating for an athlete. The ability to return to sport is broadly and variably defined, based on the pre-injury competitive level played, the goals of the patient post-injury, and the post-ACL Reconstruction (ACLR) sport level achieved [3, 7]. Although scores may be high on subjective clinical measures (a common outcome measure utilised), the ability to return to sport and performance on return may not meet patient expectations, thus making the surgery unsuccessful in the patient’s opinion. Although the concept of ‘accelerated’ ACL rehabilitation has existed since the 1990s [5, 17] the ideal surgical and rehabilitative guidelines for ACLR remain a contentious and hotly debated issue . Following an ACLR, return to sport is typically permitted between 3–12 months following surgery, depending on the surgical procedure used , with some researchers recently suggesting that a two-year recovery period before return to sport may be required to reduce re-injury risk . As part of the return to sport paradigm clinicians are often asked to make judgments about when an athlete has functionally recovered enough to allow a safe and durable return to activity. However, it is still relatively rare for clinicians to use objective physical performance measures to determine safe return to sport and, when this does occur, rarely are the specific criteria used in practice reported . The most commonly used objective criteria for return to sport reflect the various components of rehabilitation following surgery. Clinical tests normally consist of assessments of joint laxity, joint effusion and crepitus, range of movement and subjective reporting of activity or quality of life , whereas functional performance tests generally include combinations of strength, unilateral hopping, jump landing, and/or running-based tests . Previous studies have used a test battery of different functional tests to show that up to nine out of 10 patients after ACL reconstruction exhibited abnormal leg power symmetry and function at six months after surgery [16, 19]. Failure to use objective criteria post-operatively may contribute to the caution or reluctance to return to pre-injury competitive sport that is commonly observed following surgery , and an elevated risk of further injury for those who do [3, 15, 20]. Failure to satisfactorily complete six functional performance criteria before returning to team training has previously been reported to result in a four times greater risk of re-injury in professional football (soccer) players . The Limb Symmetry Index (LSI) is a commonly reported benchmark in the use of objective tests following ACL, with a greater than 90 per cent concurrence of the injured limb relative to the uninjured limb the most commonly used to determine satisfactory recovery of function post-operatively [18, 19], though literature has reported this benchmark as low as 80 per cent [6, 8], or as high as 95 per cent . However, a recent meta-analysis by McGrath et al () reported that pooled symmetry values in uninjured individuals varied from 94.6 to 99.6 per cent across these tests (Figure 1), which is above the clinically accepted benchmark of 90 per cent. 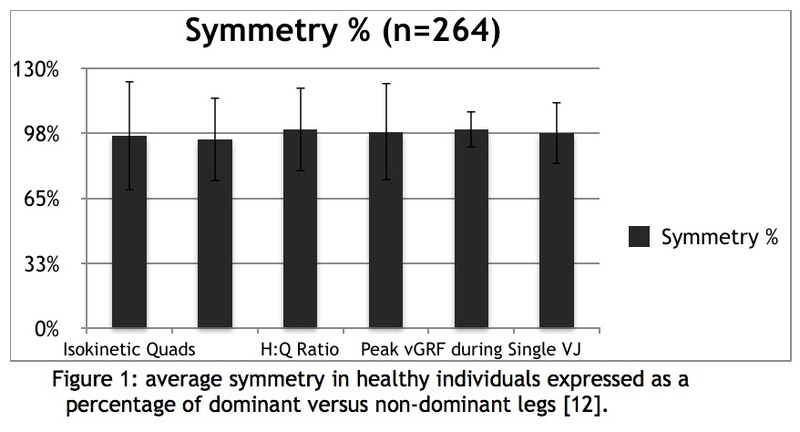 Normative values and the effect of limb dominance within these tests are also described in Table 1. Although asymmetries should not always be associated with a pathological situation without consideration of the sport specific context the athlete regularly participates in, these results might suggest that 90 per cent LSI values may be too low if seeking to restore ‘normal’ leg values post-injury and minimise re-injury risk. It is also important to consider absolute performance values in each test as part of the decision-making process, particularly where an athlete may have come from a poor physical baseline prior to injury. A better understanding of normative criteria for each performance test may be useful in providing a benchmark for clinicians when quantifying levels of performance in these tasks or making return-to-play decisions, rather than relying purely on the LSI. Knowledge of an athlete’s pre-injury values remains the preferred method of quantifying post-injury benchmarks. Table 1: normative values for functional performance tests in healthy active individuals . What tests have the strongest correlations with return to sport level? Return to Sport (RTS) success is broadly and variably defined, based on the pre-injury competitive level played, the goals of the patient post-injury, and the post-ACL reconstruction sport level achieved . McGrath et al [10, 11] prospectively investigated the relationships of cliniometric and functional performance tests on RTS following ACL reconstruction. As a reference point, 81 per cent of participants within the surgical cohort had returned to their pre-operative level of activity by 12 months (as measured by the Tegner Activity Scale), and 83% had returned to pre-operative levels of sport by 24 months, a value that is above indicative rates at similar time periods previously reported in the literature . Using these results the study examined the relationship of commonly-used clinimetric tests with to return to sport outcomes and did not observe a statistically significant correlation between the results of these tests (2000-IKDC knee examination and KT1000 laxity) and activity outcomes as measured by a Tegner Activity Scale up to 24 months post-operatively (Table 2). Functional performance tests on the other hand (Table 3) demonstrated large effect statistical relationships were observed with peak speed during running, hamstring isokinetic power and a battery of hop tests for distance with return-to-sport outcomes at 12 and 24-months respectively. Moderate correlations were observed for Timed Hop, Peak vGRF during a Jump Down task and Quadriceps isokinetic power. In the context of this data being obtained with a cohort displaying relatively high return to pre-injury sport levels (> 80%), the results of this study indicate that clinicians might seek to prioritize these tests and the rehabilitation themes they infer when seeking to maximize post-operative ACL activity outcomes. Pooled post-operative improvements of 24 per cent were observed across the surgical participants from pre-operatively to 24 weeks. Future research needs to examine absolute predictive thresholds for physical performance-based tests and re-injury risk reduction following ACL reconstruction . Table 2: Summary of Spearman’s correlations of cliniometric measures with return to sport levels at 12 and 24-months post-operatively (* denotes sig. <0.001). Table 3: Summary of Pearson’s correlations of physical performance measures with return to sport levels at 12 and 24-months post-operatively (* denotes sig. <0.001). 1. Anderson, M.J., W.M. Browning, 3rd, C.E. Urband, M.A. Kluczynski, and L.J. Bisson, A Systematic Summary of Systematic Reviews on the Topic of the Anterior Cruciate Ligament. Orthopaedic Journal Of Sports Medicine, 2016. 4(3): p. 2325967116634074-2325967116634074. 2. Ardern, C.L., N.F. Taylor, J.A. Feller, and K.E. Webster, Fifty-five per cent return to competitive sport following anterior cruciate ligament reconstruction surgery: an updated systematic review and meta-analysis including aspects of physical functioning and contextual factors. British Journal of Sports Medicine, 2014. 48(21): p. 1543-1553. 3. Ardern, C.L., N.F. Taylor, J.A. Feller, and K.E. Webster, Return-to-sport outcomes at 2 to 7 years after anterior cruciate ligament reconstruction surgery. The American Journal Of Sports Medicine, 2012. 40(1): p. 41-48. 4. Ardern, C.L., K.E. Webster, N.F. Taylor, and J.A. Feller, Return to sport following anterior cruciate ligament reconstruction surgery: a systematic review and meta-analysis of the state of play. British Journal Of Sports Medicine, 2011. 45(7): p. 596-606. 5. De Carlo, M.S. and R. McDivitt, Rehabilitation of Patients Following Autogenic Bone-Patellar Tendon-Bone ACL Reconstruction: A 20-Year Perspective. North American Journal Of Sports Physical Therapy: NAJSPT, 2006. 1(3): p. 108-123. 6. Eastlack, M.E., M.J. Axe, and L. Snyder-Mackler, Laxity, instability, and functional outcome after ACL injury: copers versus noncopers. Medicine And Science In Sports And Exercise, 1999. 31(2): p. 210-215. 7. Harris, J.D., G.D. Abrams, B.R. Bach, D. Williams, D. Heidloff, C.A. Bush-Joseph, N.N. Verma, B. Forsythe, and B.J. Cole, Return to sport after ACL reconstruction. Orthopedics, 2014. 37(2): p. e103-e108. 8. Holsgaard-Larsen, A., C. Jensen, N.H.M. Mortensen, and P. Aagaard, Concurrent assessments of lower limb loading patterns, mechanical muscle strength and functional performance in ACL-patients--a cross-sectional study. The Knee, 2014. 21(1): p. 66-73. 9. Kyritsis, P., R. Bahr, P. Landreau, R. Miladi, and E. Witvrouw, Likelihood of ACL graft rupture: not meeting six clinical discharge criteria before return to sport is associated with a four times greater risk of rupture. British Journal Of Sports Medicine, 2016. 10. McGrath, T.M., G. Waddington, J.M. Scarvell, N. Ball, R. Creer, K. Woods, D. Smith, and R. Adams, An Ecological Study of Anterior Cruciate Ligament Reconstruction, Part 1: Clinical Tests Do Not Correlate With Return-to-Sport Outcomes. Orthopaedic Journal Of Sports Medicine, 2016. 4(11): p. 2325967116672208-2325967116672208. 11. McGrath, T.M., G. Waddington, J.M. Scarvell, N. Ball, R. Creer, K. Woods, D. Smith, and R. Adams, An Ecological Study of Anterior Cruciate Ligament Reconstruction, Part 2: Functional Performance Tests Correlate With Return-to-Sport Outcomes. (2325-9671 (Linking)). 12. McGrath, T.M., G. Waddington, J.M. Scarvell, N.B. Ball, R. Creer, K. Woods, and D. Smith, The effect of limb dominance on lower limb functional performance - a systematic review. Journal Of Sports Sciences, 2016. 34(4): p. 289-302. 13. McGrath, T.M., G. Waddington, J.M. Scarvell, N.B. Ball, R. Creer, K. Woods, and D. Smith, The effect of limb dominance on lower limb functional performance – a systematic review. Journal of Sports Sciences, 2016. 34(4): p. 289-302. 14. Nagelli, C.V. and T.E. Hewett, Should Return to Sport be Delayed Until 2 Years After Anterior Cruciate Ligament Reconstruction? Biological and Functional Considerations. Sports Medicine (Auckland, N.Z. ), 2017. 47(2): p. 221-232. 15. Paterno, M.V., M.J. Rauh, L.C. Schmitt, K.R. Ford, and T.E. Hewett, Incidence of contralateral and ipsilateral anterior cruciate ligament (ACL) injury after primary ACL reconstruction and return to sport. Clinical Journal Of Sport Medicine: Official Journal Of The Canadian Academy Of Sport Medicine, 2012. 22(2): p. 116-121. 16. Petersen, W., P. Taheri, P. Forkel, and T. Zantop, Return to play following ACL reconstruction: a systematic review about strength deficits. Archives Of Orthopaedic And Trauma Surgery, 2014. 134(10): p. 1417-1428. 17. Shelbourne, K.D. and P. Nitz, Accelerated rehabilitation after anterior cruciate ligament reconstruction. The American Journal Of Sports Medicine, 1990. 18(3): p. 292-299. 18. Thomeé, R., Y. Kaplan, J. Kvist, G. Myklebust, M.A. Risberg, D. Theisen, E. Tsepis, S. Werner, B. Wondrasch, and E. Witvrouw, Muscle strength and hop performance criteria prior to return to sports after ACL reconstruction. Knee Surgery, Sports Traumatology, Arthroscopy: Official Journal Of The ESSKA, 2011. 19(11): p. 1798-1805. 19. Thomeé, R., C. Neeter, A. Gustavsson, P. Thomeé, J. Augustsson, B. Eriksson, and J. Karlsson, Variability in leg muscle power and hop performance after anterior cruciate ligament reconstruction. Knee Surgery, Sports Traumatology, Arthroscopy: Official Journal Of The ESSKA, 2012. 20(6): p. 1143-1151. 20. Wright, R.W., R.A. Magnussen, W.R. Dunn, and K.P. Spindler, Ipsilateral graft and contralateral ACL rupture at five years or more following ACL reconstruction: a systematic review. The Journal Of Bone And Joint Surgery. American Volume, 2011. 93(12): p. 1159-1165. 21. Zaffagnini, S., A. Grassi, M. Serra, and M. Marcacci, Return to sport after ACL reconstruction: how, when and why? A narrative review of current evidence. Joints, 2015. 3(1): p. 25-30.